At the time, Sarah was a driven, successful investment banker working in New York City, at the heart of the finance world. She smoked two packs of cigarettes a day, worked a 100-hour week, and travelled 14 days a month all over the world. Life was good, she thought. Ah, but childhood dreams don’t die easily. Raised a tomboy in Maine, always ready to mix it up with her brothers, Sarah became a runner at the tender age of 8. Determined to qualify for the National Junior Olympic Cross Country Championship that year, she trained hard. “I was scrawny and at the bottom of the age group. But I secured that last qualifying spot,” she recalls. The experience launched a dream of being an Olympic athlete. She went on to captain her college cross-country track team and to compete as a Division I ski racer. After that 2009 triathlon, Piampiano stopped smoking and got serious about fitness and training. Her first competition was in 2010. In 2011, she won several triathlons as an amateur. In 2012, she resigned her hard-earned NYC finance job, packed up her stuff and moved to California to chase her dream. 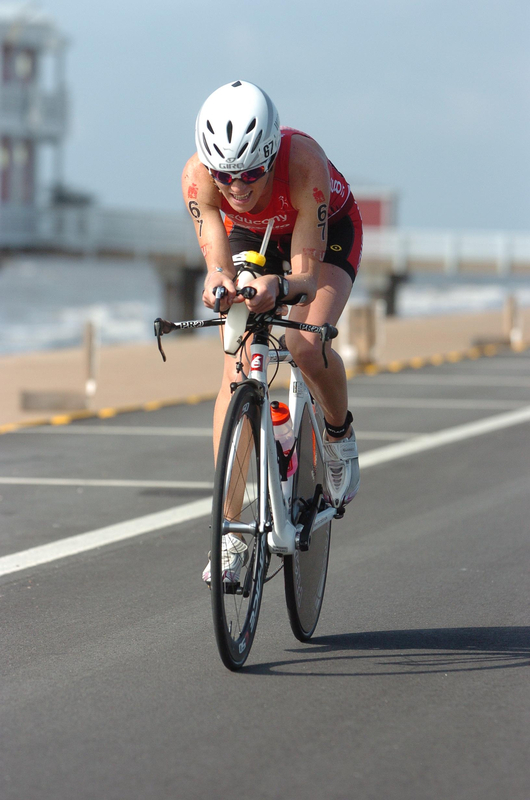 She turned pro and now competes on the international triathlete circuit. She’s picked up sponsors, won the 2012 New Orleans Ironman 70.3 and placed 23rd among the pro females competing in the 2012 Kona Ironman. Piampiano’s incredible drive and motivation have made her a successful pro triathlete. Too, she benefits from great coaches, physical therapists, and sponsors. She’s also quick to mention the Game Ready® cold and compression therapy system, which she says has been invaluable in her workout recovery. This innovative technology delivers active cold and compression therapy in a portable system to help speed healing and recovery. Think you have an active workout schedule? Here’s what Piampiano does six to nine hours a day: swim two hours, bike two to five hours, then swim another two hours if she isn’t doing a 45- minute to two-hour run. Yoga and strength training one to two times a week complement her swim, bike and run regimen. Training doesn’t stop for sore muscles, so Sarah relies on her Game Ready® active cold and compression system to speed up workout recovery. “Icing and compression is a significant part of my day-to-day recovery.” She tried other products that delivered only compression, and found that workout recovery was accelerated with the addition of cold therapy. Sarah uses Game Ready® once or twice a day, usually after a bike ride or run, to help speed up leg recovery. She finds the leg boots and the hip wrap especially helpful for training recovery, and she uses compression therapy at night in bed. Game Ready® goes with Sarah when she competes across the globe. Even if you’re not training for an Ironman, take care of your body and get a faster workout recovery with Game Ready®. To read more about Sarah Piampiano or follow her race career, check out her website: www.sarahpiampiano.com.